Lifestyle family photos are not about having the perfectly decorated home and kids that are squeaky clean - they are about capturing imperfections, about photographing you and your family interacting in a natural way; doing your little girls' favorite activity or singing your new baby the new song that always makes him smile. These are the images that celebrate family for me. The Sysons wanted to celebrate their chapter in Tucson coming to a close. Michael was just commissioned as a distinguished officer in the US Navy after many years of incredible hard work and sacrifice. 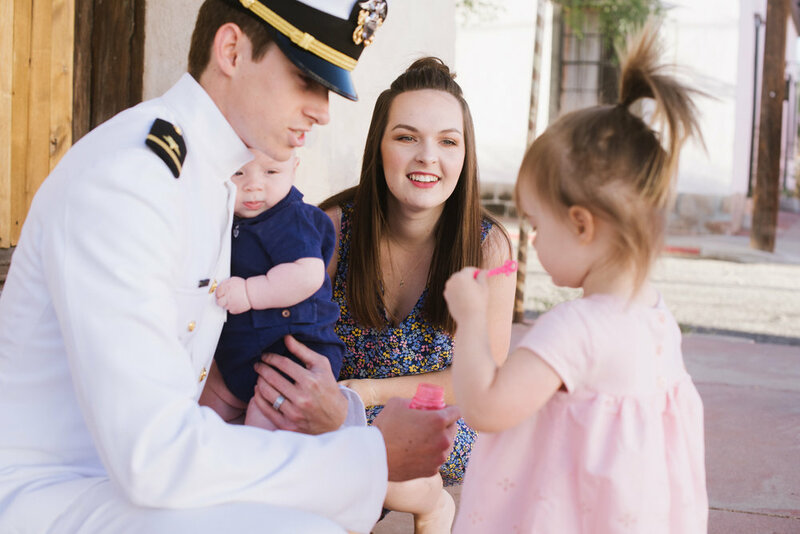 The Sysons have chosen to intentionally find community and make Tucson their home despite knowing they would have to leave some day. That time has come as they're now moving to South Carolina with the goal of making roots and finding community again. Sysons, my prayer for you is that you can do just that: find your people and know there are still so many of us rooting for you back in Tucson!